Last week, Shirley Manson tipped the rumour mill upside down by announcing that legendary Nirvana producer - Butch Vig - is producing Green Day's next studio album. Now, the band have confirmed it by posting an in-the-studio video on YouTube. The video is - probably intentionally - poor quality in both sound and visuals. It does show, however, frontman Billie Joe Armstrong playing what looks like a Sunburst Gibson Les Paul reissue and Butch Vig giving the finger while sitting on a sofa. If Armstrong's short bursts of noise are an indication of what to expect, it certainly sounds like a return to 2004's American Idiot, sound wise. One eager-eared MusicRadar hack thinks the last five seconds sound a bit like Muse's Knights Of Cydonia. While another points out that it's a common time signature, and actually sounds rather like Queen. 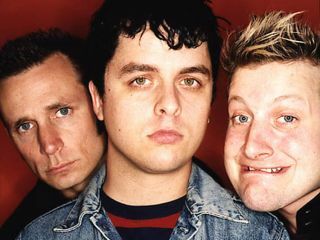 You can decide for yourself by watching Green Day's sneak preview here.